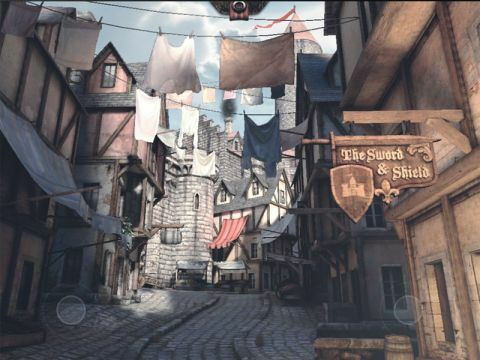 Epic Citadel isn't much of an application in itself – it's purely a tech demo of the Unreal engine for mobile platforms. It's not a game, just a 3D castle that you can walk around in real-time and admire. It's well worth doing so though, simply because of how impressive it is. Controlling it with a pair of virtual analogue sticks – one handling movement, the other looking around at the pretty scenery – you'll be instantly impressed by the high resolution textures, the reflective floors, the drop from the main castle down to the small fair outside and the many other details on display in its stunning medieval world. It doesn't compare to Crysis, but considering that the average game released on portable devices is a simple 2D action or strategy title, it looks incredible. It's hard to believe that it's being generated on something like the iPhone 4, and even though the iPad version occasionally struggles to maintain its framerate, it never risks becoming anything less than playable. This isn't the only 3D powerhouse on the way – John Carmack has announced that he's porting his Rage technology across as well – but it's the first time we've been able to see graphics this powerful in the wild. If this is what smartphones can do now, relatively underpowered and short of memory as they are, the next few years are going to be incredible for mobile games, applications and anything else you could possibly imagine. Of course, they'll probably still struggle to make calls.